Whenever we’ve visited Le Marche we’ve always stayed with good friends in the pretty hill town of Appignano di Macerata (see map), in the heart of this picturesque region. It is situated exactly half way between the sea and the mountains, just a 30 minute drive each way. Not to be confused with Appignano del Tronto further south in Ascoli, this medieval town is known nationally for its production of ceramics (produced here for over 500 years) furniture and clothes. La Chiesa di San Giovanni Battista (St John the Baptist), built in the 16th century and renovated in the 18th century. La Chiesa dell'Addolorata (Our Lady of Sorrows) built for the first time in the Middle Ages and rebuilt in 1746. 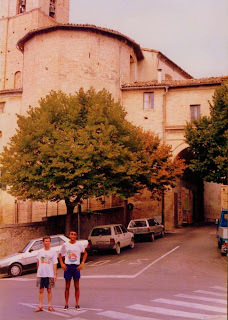 Il Convento di Forano 1473, known for having hosted, according to tradition, St Francis of Assisi. 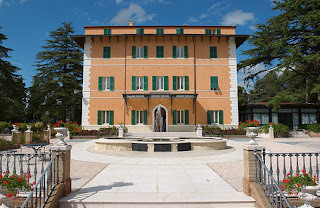 Villa Tusculano, a villa built in the Napoleonic era under the patronage of Count Leopoldo Armaroli. Villa Forano – Winery. The Cellar is open everyday for winetasting from 8:30 to 12:00 and from 15:00 to 19:00 (except Thursdays and Sundays). Like most towns throughout Italy, Appignano has its own special events that are unique to the area. During the first week of July, for three evenings, a festival called Bellente il Brigante takes place in the town hall square. It is a traditional dinner for about 180 people with typical dishes of the 19th century. More than 70 actors in period costume, extras, musicians and dancers represent the history to the spectators. Around the guests, the actors evoke the habits of Appignano’s inhabitants in 1812, when life was influenced by the contradictions of the Napoleonic state and by the legacy of the papal authority. Among the events of the period that are represented in this festival, there are the stories of the young Appignanese hero Pietro Masi and other characters who actually existed. The spectators are comfortably seated at long tables and enjoy local recipes from the 800s, served in typical bowls handmade by local artisans. The aim is to give tourists the opportunity to experience Appignano’s local traditions, culture, folklore, food and wine. In mid-October Appignano hosts another gastronomic event called Leguminaria. It is dedicated to legumes (chickpeas, beans, lentils and roveja). Roveja is the dialect name for field pea which is only grown in the Sibillini Mountain National Park in Le Marche. All of the dishes are prepared according to traditional recipes and are served in earthenware bowls specially made for the occasion by Appignano’s master potters. Everyone who attends the meal can take home their bowl as a souvenir of the occasion. 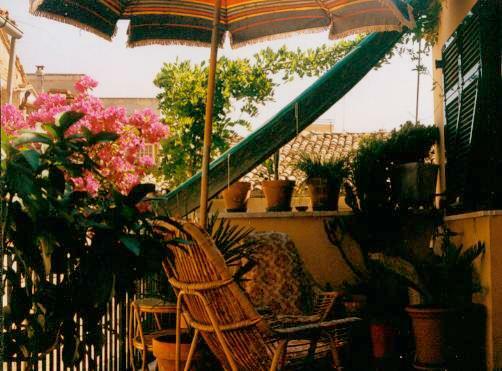 Much appreciated by lovers of rural tourism, the town of Appignano di Macerata is ideal for short or long term stay and is devoted to well-being and culture. Rustic ambience and family oriented for a taste of local flavors, such as: cappellacci (pasta shaped like little hats) with fonduta (melted cheese) and truffles, gnocchi with a traditional meat sauce and ‘cargiù’ with porcini mushrooms and cherry tomatoes, grilled crescia (onion flavoured focaccia) the perfect complement to the delicious salami and pecorino Sibillini. ﻿ Villa Verdefiore: hotel (agriturismo) and restaurant located on the edge of town with lovely rooms. A very nice place with a huge park all around it. Good for weddings, celebrations and meetings. Good food, price middle/high. ﻿ ﻿ La Colombaia: A beautiful country house with a Wellness Centre located at the edge of Appignano. Good food, middle/high price. Lovely outdoor swimming pool. 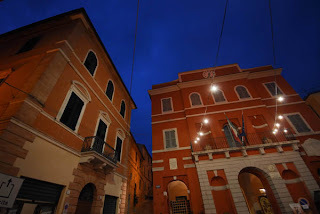 - Ristorante Lord Byron, located in the historical main square. They serve home made food, typical of Le Marche; nice place, nice people, nice price! 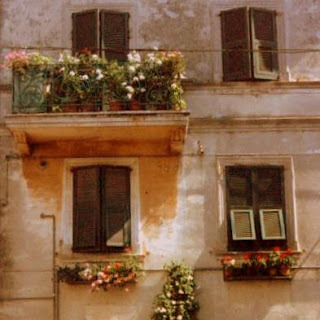 - Ristorante Le Grazie, situated not far from the centre. They also serve home made food. It is an old style restaurant for good food and a good price. - Bar H, located in the industrial area of Appignano. Young people meet there. Bar H in Italian sounds like "baracca" which means chalet or cabin. In fact it is made of wood like a mountain cabin... in the middle of the industrial area! - Bar del Borgo: located in the borgo of Appignano. Middle aged and older people meet there. - Bar White Lady: located near Giuseppe's pottery shop Ceramiche fratelli Testa .Young people meet there. In Stefano’s opinion this one is the best bars in town. - Bar Giardino dei Tigli: located on the 'monte' of Appignano. We went there to have an ice cream last summer. Most young people meet there during summertime. There are two pubs in Appignano and you can get a very good takeaway pizza at Pizza E Vai. - Dal Tramonto all'Alba Pub: nice place located in an old Italian cinema's room. The son of Giuseppe the potter, Mauro Testa, designed the interior. On Saturday and Sunday evenings families go there to have pizza for dinner because they serve great pizza. Sometimes they play live music. (In Italian): Ah! vieni da Appignano. C'è il ‘porto’ ad Appignano. Ci venivo da giovane a verdere le gambe delle donne! (In English): Ah! You come from Appignano. There is a port in Appignano. I used to go there when I was young to look at the women's legs! " Last but not least, Appignano has its own rock stars! They are a Rolling Stones tribute band who call themselves The Kingstones. Ciccio (Alessio), Stefano’s brother, is an excellent guitarist. They usually play in the nearby town of Macerata and went on tour last winter playing in Milano, Napoli and Salerno and it was a big success. Have a listen here and see how great they are! (Ciccio is wearing the black sleeveless shirt). Carissima Nora, thank you for describing a charming family atmosphere of a small medieval borgo. It is very similar to that of Abruzzo, indeed. Surprisingly, it has many lovely places to visit and to eat in. Thank you for all the wonderful info. I love Le Marche and definitely want to return there. Yes Tatiana, I was surprised by the number of good restaurants and bars in Appignano too - information from someone who lives there is the best! Thanks Janie, hope you get to visit Appignano when you return to Le Marche. I think you'd really like it there.